Josue Fred joined Grafton last summer as maintenance supervisor – although his work on behalf of our consumers goes far beyond that! He not only keeps our facilities running smoothly – making sure the environment is maintained and appealing to kids of all ages – but he is also an accomplished artist and sculptor. 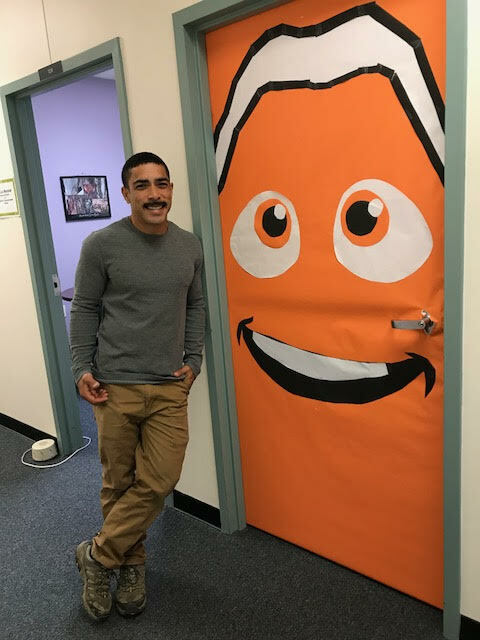 He uses these extraordinary skills to enhance our school by, for example, changing the character on his office door quarterly. Get to know Josue in the following employee spotlight. I became aware of the unique opportunities that were available at Grafton for someone with my skillset. Over the years, I’ve learned how to do custom fabrication, renovation, repair, plumbing, electrical, flooring, and coating. So if there’s something that Grafton needs, I can pretty much figure out how to do it. Combining all these skills makes me pretty effective at what I do, especially when it comes to changing residential properties to better accommodate the clients we serve. What is your background? Where did you pick up all these skills? I started off as an art major at the University of Las Vegas with a focus on drawing and painting. During that time I apprenticed with an Italian sculptor, which gave me the chance to produce sculptural work. I also have about 12 years of experience doing different types of construction work, and about four years experience doing custom fabrication work. I used to make signage for companies like AT&T, Charles Schwab, and Hard Rock Hotel. It’s pretty cool – Grafton is finding plenty of opportunities where I can apply these creative talents. The staff and our Executive Director here in Richmond, Lisa Marshall, are always excited about new ideas. It’s a lot of fun. How have you put your creativity to use so far? Oftentimes, I’m modifying an environment to better meet the clients’ needs. For example, we had a client that was drawing on walls. Rather than trying to “control” her behavior, we wanted to work with it, but channel it in a way that was helpful and supportive. So, we constructed a chalkboard in her room. That way, we could direct her creativity to that one surface and also encourage the behavior instead of trying to restrict it. I’ve also done a few fun things, like making “your face goes here” cutouts for the staff holiday party. Around Halloween, we were having a decorate-your-door contest at the school, so I did Kermit the Frog and all the kids loved it. After Kermit, I did Finding Nemo. It’s pretty cool because it adds to the environment and is lighthearted and humorous. Grafton is just a fertile environment for this type of creative thinking. At the end of the day, it’s really the clients that are benefitting, and we get to stand back and be proud of everybody’s effort. Instead of just doing a huge mural, we decided to do an open call for students to draw the Grafton owl, because we needed a logo for our school mascot. We got some neat results, and we’re really excited about some of the ideas that were submitted. Now, we’re going to use that owl, blow it up to about 10 feet in height, and paint it on the fence. We might even have the students come in and fill in the colors. The clients at Grafton are just really positive, friendly, and special. Though my interactions are more limited than their teachers and direct care staff, when I do engage with them, it just warms my soul. They’re great kids and they encourage me to work harder. In my previous jobs, I had a detachment from the work I was producing and the people who were benefitting from it. But working at Grafton, I get to see who is actually benefitting from my efforts. My favorite experience so far is watching the Grafton Owls basketball team play. It was incredible seeing the kids learning to dribble, pass the ball, and work together as a team. You see the students in the hallways high-fiving each other. You can’t help but get super excited to see them have this opportunity. My coworkers and I love talking about the games afterwards or those coming up. You would think we were talking about an NFL team! What makes Grafton special is really the passionate staff. Our job is unique because it requires us to be on top of our game at all times; that’s why the camaraderie and teamwork is really important. Everybody encourages each other, and that’s typically when you get the best out of a team. It’s a tough field, but there’s so much opportunity to really be passionate about what we’re doing. I’ve only been here seven months, and I can’t wait to see where we’re going to be a year from now.